Sumo is now popular word for people all over the world. Sumo is one of the very common sports in Japan since long time ago. However, do you know when Sumo wrestling starts? And how people continue playing Sumo until now? I would like to explain brief summary of Sumo wrestling history. The origin of Sumo is ancient time. It is said to be about in the middle of three century. It was Kofun period (250-538 CE) in Japan during in the middle of three century. Some Sumo drawings found from this era. In Heian period (794-1185 CE), people started to gather Sumo wrestlers from countries and play Sumo in front of emperor. This became “Sumohinosechie”, which is official event later. However, this official sumo event ended at the end of Heian period somehow. The record about there was a great strong Sumo wrestler, who was a person of lower rank found in Kamakura period. In Muromachi period, some generals started to enjoy watching Sumo, and “Dohyou” which is a Sumo ring created by Nobunaga Oda. “Kanjinzumo” which is a sumo event held to raise money for a temple or a shrine started in Edo period, and this is the beginning of the base of Sumo nowadays. Sumo was prohibited during Meiji period because it was prohibited to be naked in public. 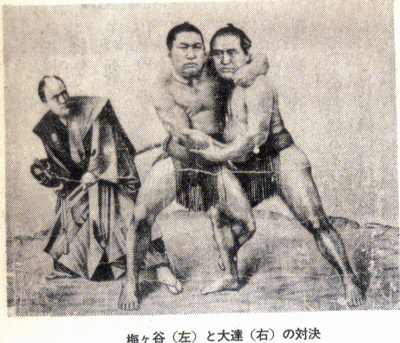 Meiji emperor and Hirofumi Ito saved the abandon of Sumo wrestling. After survived from prohibition, radio spread out to ordinary homes and many people enjoyed listening sumo on the radio. However, World War II happened around this time. Almost all sumo wrestlers were drafted and sumo field corrupted by Great Tokyo Air Raid. Sumo was about to disappear after WWII, but the TV became common to Japanese people and NHK Sumo channel started. Ryogoku National Sports Field finally rebuilt in 1985. This would be the signature of the fully recovered of Sumo from deep scars by WWII. I just explained only a brief summary of Sumo history this time. If you would like to know more about Sumo, please feel free to comment and ask me! The Ninja How convenient Japanese convenience stores are ! There are many Kawaii in Japan. Breathtaking city views in Heart of Tokyo Never miss the masterpieces of Japanese movie! 【For those who has advanced Japanese skills!】 Do you know how to read these names of places? Japanese Teahouse vol.2 ～How to enjoy Japan～ Why Japanese people wearing cold mask (Surgical mask)? Have a meal in a Japanese Elementary School Classroom! Never miss the masterpieces of Japanese movie!